On June 24th my friend Melanie and I spent the morning at the Luskville Falls trail in Quebec; it happened to be Saint Jean Baptiste Day, a well-known Quebec holiday. Originally celebrated as the feast day of St. John the Baptist, the connection between Saint Jean Baptiste Day and French-Canadian patriotism was born in 1908 when St. John the Baptist was designated as the patron Saint of Quebec. Melanie and I originally intended to spend the early part of the morning at the Champlain Lookout and Pink Lake in Gatineau Park, but as the only road up to these two places was closed to vehicular traffic until 11:00 a.m., we decided to make the drive to Luskville Falls instead. 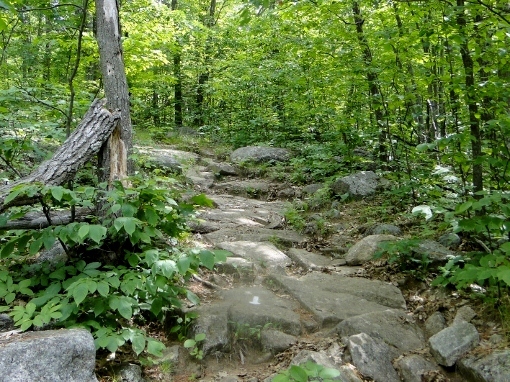 The Luskville Falls trail leads up to the top of the Eardley Escarpment, which contains the richest and most fragile ecosystem in Gatineau Park. 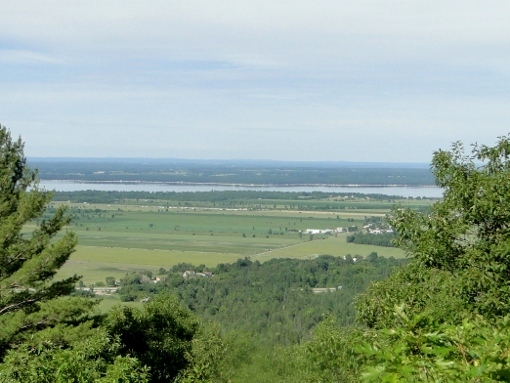 The Escarpment forms the dividing line between the rock of the Canadian Shield and the St. Lawrence Lowlands. 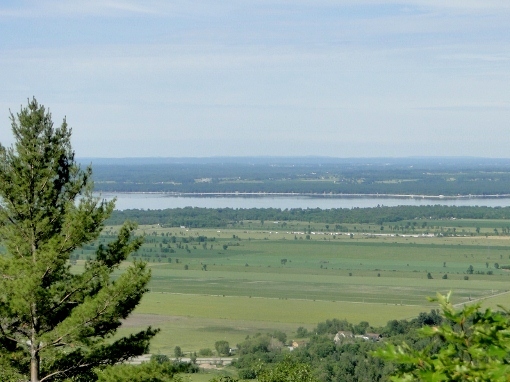 It rises 270 metres from the floor of the Ottawa Valley and extends more than 30 kilometres. 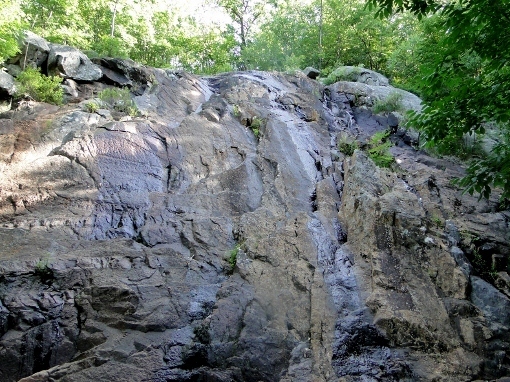 The waterfall is only a short hike from the parking lot, and is most spectacular in the spring when runoff from the melting snow increases the volume of water cascading down the face of the escarpment. It didn’t take long to reach the falls. 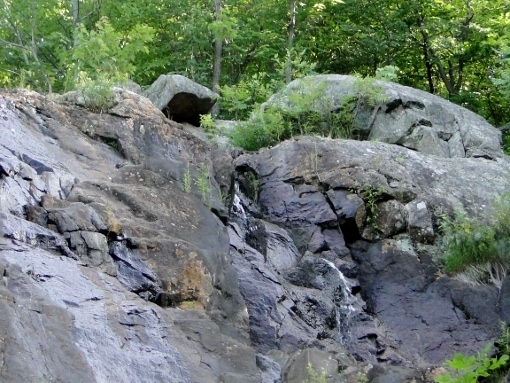 Because we’d had a relatively dry winter and little rain this summer, only a trickle of water cascaded down the face of the rock. 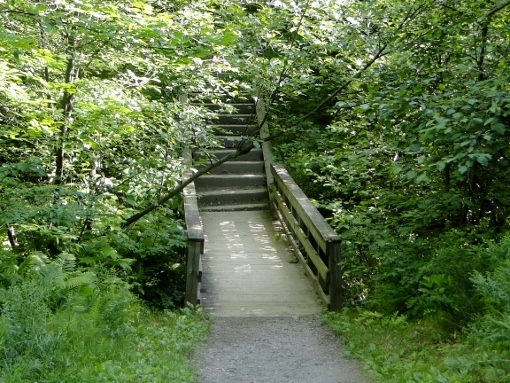 After leaving the waterfall, however, the trail becomes mostly vertical. Indeed, the nice gravel path at the bottom of the stairs had vanished, to be replaced by a jumble of rocks with no clear-cut way up them. Only a few arrows painted on the rocks told us we were on the right path, and for the most part we were holding onto trees and using our hands to pull ourselves up metre by metre. Some parts were more difficult than others, and I had to stop to catch my breath several times. When we came to a relatively flat area next to the stream, we stopped to scoop water from one of the pools onto our faces to try to cool down. We heard a Black-throated Blue Warbler singing just across the stream, and I spent several minutes trying to spot him, to no avail. We saw a couple of chickadees, Chipping Sparrows and Red-eyed Vireos on the way up; near the top we saw a group of grackles wading at the edge of the water and managed to spot one of the Black-throated Green Warblers we heard singing. When we reached the top, the view was spectacular. The body of water in the distance is the Ottawa River. We sat down in the shade to have a snack and drink some water. A male Blackburnian Warbler landed in a tree close by but flew off before I could get Melanie on him. A Yellow-bellied Sapsucker that landed in the same tree was much more obliging. We also saw a White Admiral butterfly fly by, and heard a Broad-winged Hawk calling as it flew overhead. I only managed to catch a glimpse of him before he disappeared. After our break we continued on our hike. The trail leaves the large open area at the top of the escarpment and heads back into the woods at that point, and to my disappointment I found we were still heading up an incline. My legs were starting to protest by then, but I forgot about my discomfort when I heard a chip note I didn’t recognize and realized I was being scolded by a Canada Warbler with food in its beak. Melanie and I watched this colourful warbler with the black necklace and white eyering for a while; then it was joined by a second one – also with food in its beak! I guessed that we were near a nest and decided not to linger any longer, even though I was hoping to get a picture. We heard the beautiful song of a Winter Wren and found a small orange moth in the same area. In flight it looked like a pale European Skipper; when it landed it furled its wings. Its eyes were an unusual turquoise colour. We had to cross the stream to continue our way along the trail. It was becoming apparent to me that the NCC doesn’t believe in providing any easy routes; there were no stairs during the climb, no handrails, and no bridges! Fortunately the low water levels made crossing over the rocks easy, though I’m not sure I would whether the same could be said in the spring. We found a few Ebony Jewelwings at the crossing. We had to cross the stream again, right in the spot where I had heard the first Black-throated Warbler singing. He was still singing away in the treetops, well out of view. On our way down we met a hiker who told us he had seen several “blues” (the gossamer-winged butterflies) feeding on some sumac blossoms at one of the lookouts. I thanked him, and Melanie and I continued our way down looking for the spot. It wasn’t the next lookout down, but the last one before reaching the waterfall. The sumacs were only about two feet in height, and were growing right near the edge a little below the main ledge. I scooted as close as I could and found the butterflies. 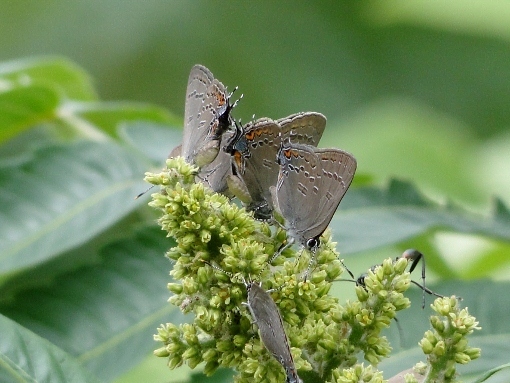 They weren’t blues, they were hairstreaks….Edwards’ Hairstreaks! 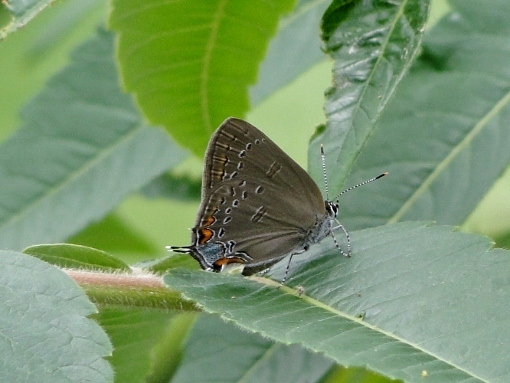 A relatively small, tailed butterfly, the Edwards’ Hairstreak is dark brown above, sometimes with an orange spot above the tail. 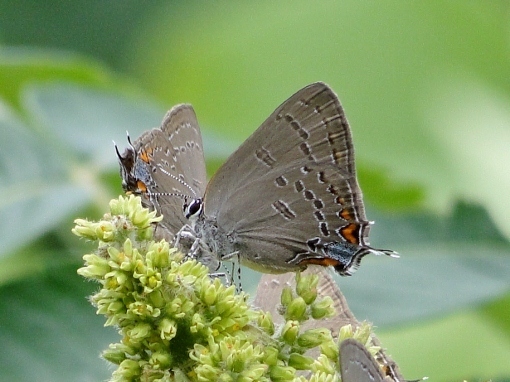 It is distinguished from other similar hairstreaks by the band of white-rimmed circular spots on the undersides, although in some individuals this chain is reduced or absent. 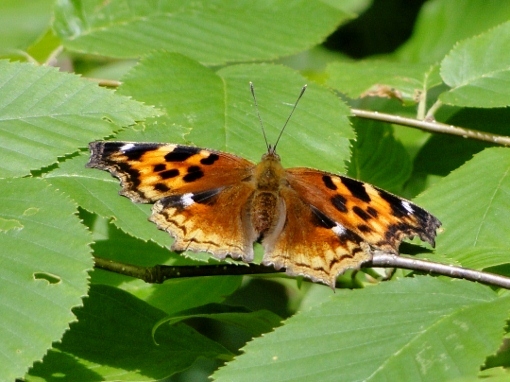 It also has a long orange mark along the inner margin of the hindwing underside. Similar species have only a small amount of orange. 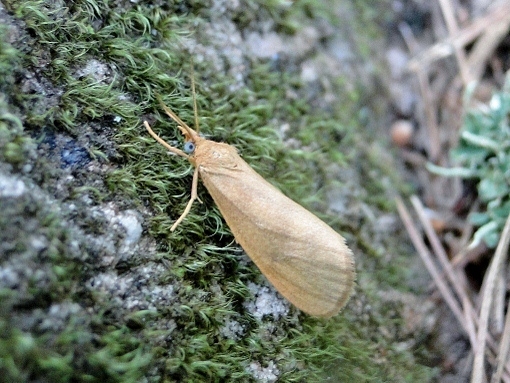 The adults fly from late June into August in Canada and are usually found near oak, the larval foodplant. 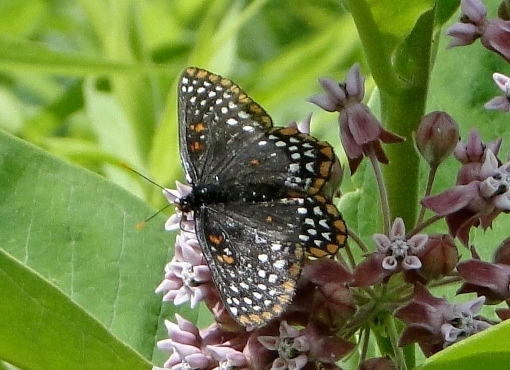 They are attracted to a variety of flowers, especially milkweed and White Sweet Clover. 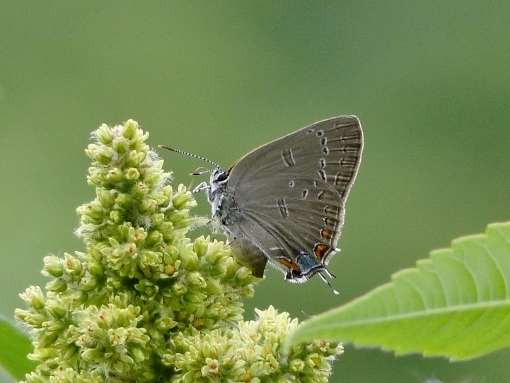 While it is fairly common in southern Ontario and Manitoba, this hairstreak is quite local and rare at the extreme limits of its range, such as in the Ottawa area and in southern Quebec. This was my second hairstreak in as many days, and my second lifer! I spent quite a bit of time photographing them, enchanted with these butterflies despite the yawning chasm below. A few bees and wasps were also feeding on the sumac. We noticed an Eastern Tailed Blue resting on the ledge nearby, a smaller cousin of the Edwards’ Hairstreaks. Then we headed back down to the bottom, passing several groups of hikers along the way. 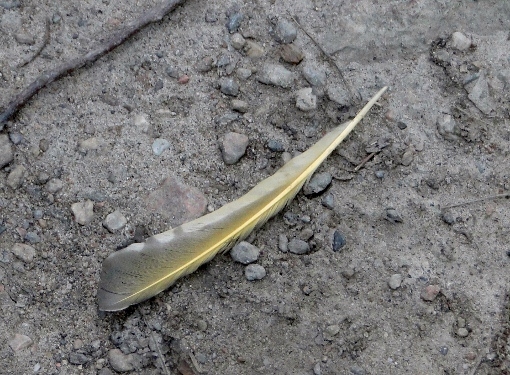 Near the parking lot we discovered this feather on the ground, which likely came from a Northern Flicker given the yellow shaft. 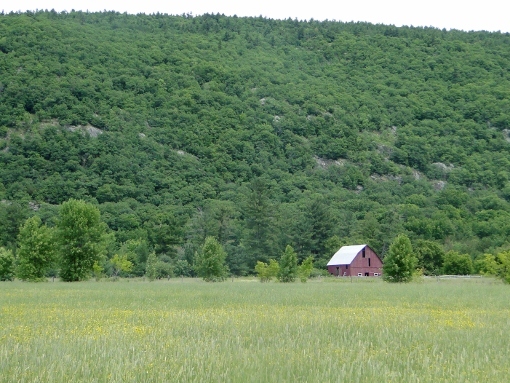 From there we followed the equestrian trail to the meadow I had visited with Rick and Larry last year. Right away we spotted a few large, bright orange Monarch butterflies gliding above the flowers and a Silver-spotted Skipper holding court in the middle of the field. It was quite aggressive, frequently leaving its perch to chase other butterflies away. A few orange skippers and Northern Crescents were also present, as was a single Baltimore Checkerspot. 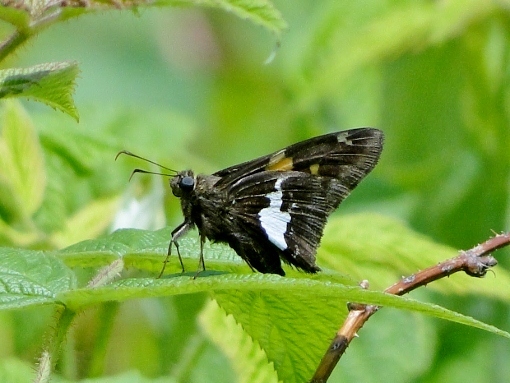 I had to walk through the brambles to get close to the Silver-spotted Skipper; he wouldn’t stay still for more than a few moments at a time, and kept landing further and further away. 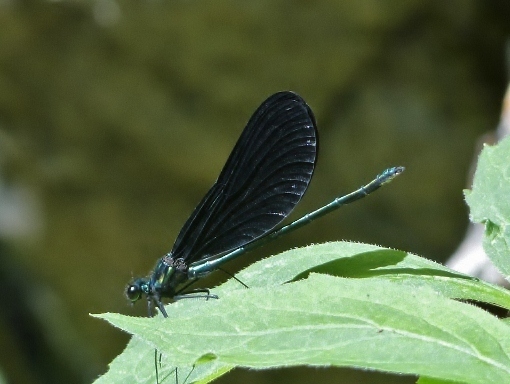 I checked the creek and found lots of Ebony Jewelwings near the water. Last year I had seen a large dragonfly with yellow and black markings on the abdomen patrolling the river, and brought my net in the hopes of seeing him again. I spotted a black and yellow dragon near the water’s edge; fortunately he perched on a branch overhanging the creek instead of flying off, and I was able to get some pictures. 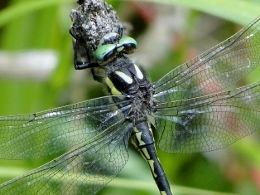 It wasn’t a clubtail, which I was expecting, but a spiketail. 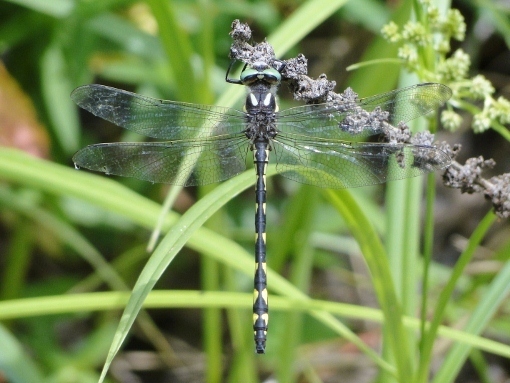 Only three spiketails occur in eastern Ontario: Arrowhead Spiketail (the only one that I’ve seen before), Twin-spotted Spiketail, and Delta-spotted Spiketail. 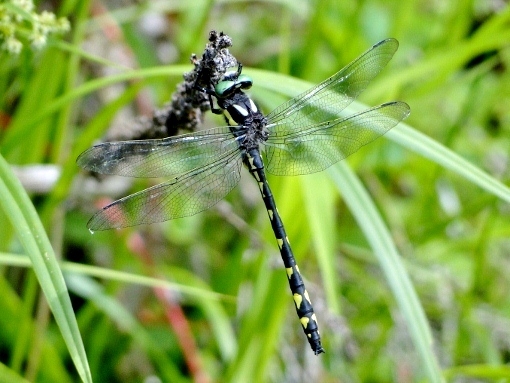 According to the book “Dragonflies Through Binoculars”, spiketails are not commonly seen “except at just the right time and place.” They inhabit seepages, trickles and forest streams but feed mostly in fields. This one is a Delta-spotted Spiketail as indicated by the triangular-shaped spots along the abdomen, a lifer for me! 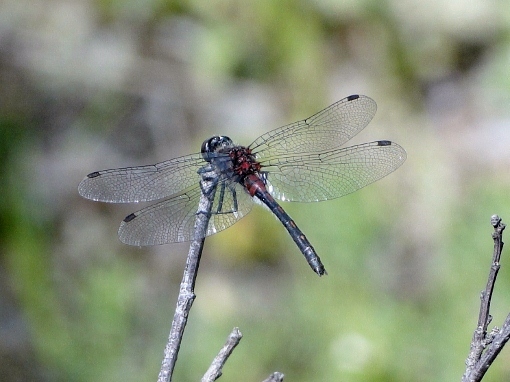 These spiketails inhabit sunny seepages and small streams and feed in forest clearings. We didn’t spend a lot of time in the meadow as the heat and the deer flies were becoming annoying. After getting bitten a few times, Melanie and I decided to leave. On the way out we spotted this beautiful, fresh Compton Tortoiseshell. I thought it was a Comma or a Question Mark until it landed on a leaf at about eye level. Our legs were still a bit shaky from the climb up the escarpment, so we decided to return to Ottawa instead of heading over to the Champlain Lookout. It was just as well, for dark clouds were moving in and we ran into some rain on the way back. We both had a lot of fun and found some interesting bugs and birds in Gatineau Park. Some of the birds, such as the Canada Warbler, the Blackburnian Warbler and Black-throated Blue Warbler, are ones that I normally only see during migration on the Ottawa side of the river. These birds, and the Edwards’ Hairstreaks on the rocky ledge above the waterfall, made the arduous climb well worth it!